Perseverance was the motto for NORCO 16 Black throughout the season. Battling through injury after injury, yet still competing at a high level and earning a bid the Nationals, despite losing a starter to a season ending injury before the JNQ. The goal going into Nationals was again, persevere throughout each match and come back to Colorado with a medal! Day one the team came out with lots of energy, going 3-0 and not conceding a set. Day two started with a bang, as well, winning the first two matches and to bring them to 5-0 on the tournament. In the last match of the day against SA Magic, the #1 team in the pool, we knew it would be a tough test. We lost a tight match, competitive match. The third day brought an important match against NOVA, a match we needed to win to secure us a second place finish in our pool. We played a competitive match and came out with a 3-set win after bouncing back from losing the first set. Later that evening, we played a challenge match against Club One from Arizona. The winner would get a second challenge match with that winner moving on to the gold bracket. Playing on the championship court, we stumbled a little out of the gate and dropped set one but bounced back and dominated set two. The girls fought a back and forth game in set three but ultimately dropped a tight set, putting us in the Bronze bracket. With a new goal of winning the Bronze bracket, we won both our matches on day four, winning the Bronze bracket and finishing in 17th place out of 64 teams! The girls had a great tournament, finishing 8-2 on the week. Detroit was a fun city to explore while we weren’t playing and the team got to create some awesome memories together. They will be back next season with a new fire, looking to meet their goal of winning a medal at Nationals! Front Range 151 White won a bid in the American division of the JNC through the RMR qualifying tournament. At the JNC Front Range White was in a pool of 8 teams. Going 3 sets in 5 of their 7 pool matches, Front Range finished 6th in pool. They lost their Challenge match to Empowered 15 Elite, which put them in the Flight 5 division. After wining their first match in 3 they lost their final match to Arizona East Valley Juniors. 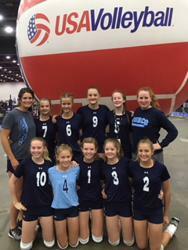 Front Range White competed hard the entire tournament going 3 sets in 6 of their 9 matches finishing 42nd. Elevation Volleyball’s 13 Peak girls team had a very positive and rewarding experience at the 2018 Girls Junior National Championship in Detroit. 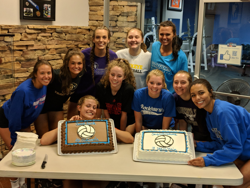 With a winning start to the four-day tournament, Elevation 13 Peak met up with tough competition and impressive talent from across the country. One of the most memorable moments came at the end of day two as the team faced a 5-hour court delay that put their last match at 9:30pm. Dropping the first set 22-25, 13 Peak fought hard through the second set to win 25-18 and force a third set. The third set was the most inspired volleyball that 13 Peak played all season as they put their training and tenacity to work, and rallied back from a 6 point deficit to win the third set 15-10. The remainder of the tournament was equally inspiring, but that match was a testament to the value of trusting teammates and training, and believing in that of which you are capable even when an opponent has a physical advantage. The Momentum 17 Shane team had a very successful season starting the year off by winning their age division for RMR Classic. They finished 18th overall in the RMR Mixed Age Division. 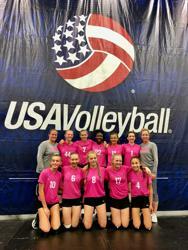 Momentum 17 Shane took 3rd in the Zelinkoff Bid Tournament and earned a reallocated bid to play in the 17 American division of GJNC. 17 Shane had a tough first two days in the 17 American division going 1-2 each day. They split days 3 and 4 going 1-1 each day. 17 Shane finished 42nd overall. 17 Shane had a fun time in Detroit hanging out and going to dinner together. Elevation 16 Peak Boys had our first experience at nationals this last July. We felt as a team we were rising to the occasion with practice. Over the 4 days this team performed well, improving with each match. Jayden Pascua and Gavin Claravall helped lift the team with their outstanding defense and high flying offense. Setter Sheldon Lucas lead the team in assists and Ryan Taylor passed and played some excellent defense. The 4 day format took some adjustment but when all things settled down Elevation won their wave to finish off a great inaugural season. This year’s Norco 12 Black earned a bid to Nationals at the Zelinkoff Tournament in May and were very excited to get to train for another 6-7 weeks before we departed for Detroit in Michigan. 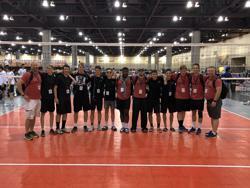 We departed on the 26th of June and arrived at the COBO convention center just in time to cheer on the Norco 15 Black team in their win over Austin Juniors. We had a short pass and serve practice and did our best to acclimate to our new environment. We were lucky to play in the afternoon wave for our division because our team members were very spread out around Detroit. 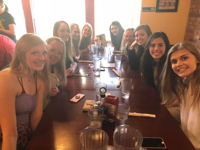 We enjoyed a fabulous pre-game meal and spent time reminiscing about the 2018 season as we handed out end of the year awards. We made our way to the convention center for our first match, found our court and began warm-ups for our very first Nationals ever! The team was pretty excited and had a hard time controlling our adrenaline as the first whistle blew. We struggled to serve in bounds and to pass the ball to target. We came up short against the MAVs from Kansas City but managed a few bright spots by hitting the ball really hard. In our second match against St. Louis HP, we came out with better focus and confidence and got our first Win. Our third match of the evening was against Alamo and again we struggled to serve in bounds. We lost the match, but finally started to get a little more comfortable with our passing. On Day 2, we played much better, but ran into a very talented Top Select Florida team. They were very physical and had great servers. We played very well against them and even lead for some of the match but we weren’t able to get a win. In our final match of Pool Play, we matched up well against 360 Virginia Volleyball Club and came up with a big win. We finished 2-3 in Pool Play so we did not get to move up towards the Gold Bracket. At this point the best we could finish was 25th overall. Day 3 was great for us and we came up with 2 big wins over Kent Juniors and Central Iowa Select. We were finally comfortable and looked like our old selves in the pass and serve game. We were able to run a great offense and our hitters really shined. On our fourth and final day of the competition, we played MVSA Volleyball Club out of Maryland for a chance to play for the Flight 1 championships. We played great and our girls really shined as servers. We had great communication on the floor and won our match in 2 sets. In the finals of Flight 1, we played San Francisco Elite. They had very good attackers and blockers, but our team was super motivated to win our last match of the season. We won in 2 sets and finished the season 25th overall in the American Division. Our team learned to be much more comfortable being uncomfortable in a new environment where the ball moved and felt differently. We fought our way back from having low confidence as passers and servers to become extremely strong in these two areas by the end of the tourney. We are excited to return to our club and to Nationals next year in Indianapolis. The 303VBA 14 Alpha team wrapped up their season at the 2018 GJNCs in Detroit, MI. The team earned their bid in the RMR Zelinkoff Championship in May. On Day 1, the nerves were evident as the girls lost their first two matches with uncharacteristic errors against CinciVB Academy 14-1 and Sunshine 14 South Bay (who ended up finishing 2nd overall). They rallied to win their last match against Niagara Frontier in a 2 set nailbiter. On the second day, pool play continued (14 Alpha was in a 7 team pool). After tough losses to EC Power 14 Ocean and OT 14 W Jon, the team bounced back with a great win against a tough TIV 14 Elite Black team. Day 3 started with the final pool play match against Sky High Adidas 14 Red. It was a must win in order to secure a higher finish, and the girls came through with a convincing win, 25-19, 25-18. The day concluded with a challenge match against ASEVC 14 Premier, and the girls pulled together for a gritty 3 set win, 19-25, 25-21, 15-8. Day 4 put the girls in Flight 1 and unfortunately ended early as 14 Alpha lost the last match to Miami Xtreme 14 Black in two sets. Overall, it was a positive experience for the girls as it was the first trip to JNCs and will prepare them for future trips to Nationals! The Momentum 18 Staci team had a successful season and trip to Anaheim for the 18’s GJNC. Prior to Anaheim they finished ranked 2nd in the RMR Mixed Age Division. They proudly represented Colorado in the 18 American Division in Anaheim at the GJNC of 2018. The first day of pool play they played hard and won all three matches in 2. Day 2 proved to be a bit more challenging but still pushing matches to three sets and winning their last match in 2. They had a heartbreaking loss in their Challenge Match for Gold, losing in 3 with the third set going 14-16. 18 Staci finished the tournament in the Silver bracket taking 13th overall. The team hung out at the pool and went on several fun team bonding events in Anaheim. 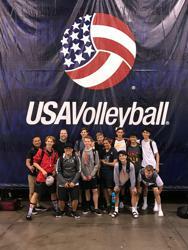 Our team was a great representation of Colorado Boys Volleyball. Elevation 18 Peak was made up of a wide diversity of players. Our setter was a 16 year old Sophomore from Cherry Creek High School, Yardan Kelman. He and our three seniors represented Ponderosa, Cherry Creek and Overland High Schools and the remaining players represented multiple schools like Grandview, Denver West, Heritage and Castle Rock. Many of the boys had been playing together for several years and had a significant bond. As we entered pool play at the National Tournament our goal was to play to our team’s strengths. The National tournament is a multi-day event and requires each player to be on the court and frequently play different positions. We played teams from all over the United States. Our highlight was on the third day when we fought to win our bracket and beat a team from Southern California in 3 games. The boys played with pure emotion and at the end of the match both teams joined together to take a team picture. Participating in the National Tournament gave our young men an opportunity to compete at a high level while also learning important life lessons.